When I was in preschool we lived in Troy, Alabama. Although small, the town did have a college with a performing arts center. One day Pirates of Penzance came to town. The female characters with their flowing dresses and parasols descended upon my pre-school class to raise awareness of the show. The performers stole my heart and took it to the theatre. I never fully got it back. I went home and begged my parents to take me to the performance. They did. The entire family went to see Pirates of Penzance. I loved it so much that decades later my brother would remember me wearing out that old VHS tape of the movie. “Again!? !” he would complain every time it was my turn to pick what we would watch. He did learn all the words to “I Am the Very Model of a Modern Major General,” although I think it was against his will. I like to think it impressed his girlfriends later in life. After Pirates of Penzance came the Music Man. Those are the two I really recall well, although I’m sure there were more. Then we moved and never got back into the theater, until I came across an audition for a local children’s theatre. I had to beg my parents to try out. I was one of those overly committed students with an arsenal of college preparatory extracurricular activities and the commitment of multiple rehearsals and performances meant a lot of travel arrangements and finagling. Finally, my parents told me if I could find a way there, they would let me audition. And most importantly if I won a role, they would help me find a way to rehearsals. And I had a wonderful time at that audition. The part of my audition I remember the most was when they had me do improv. The panel suggested prompts and I reacted. I can still feel the itchy backing of that old chair as I curled up tight, imagining myself as a cold, frightened little door mouse who had heard a strange noise. Neither my family, nor I really anticipated that I would get a role. Not on my first audition. When the day came to find out if I had landed a part, I dialed the phone with nervous hands. A voice recording announced the names of the cast members. I jumped and screamed when I heard my name. Then, I called back at least twenty more times over the next two days, just to make sure. Being in that play and meeting other people my age who wanted to participate in community theater was one of the best experiences of my life. 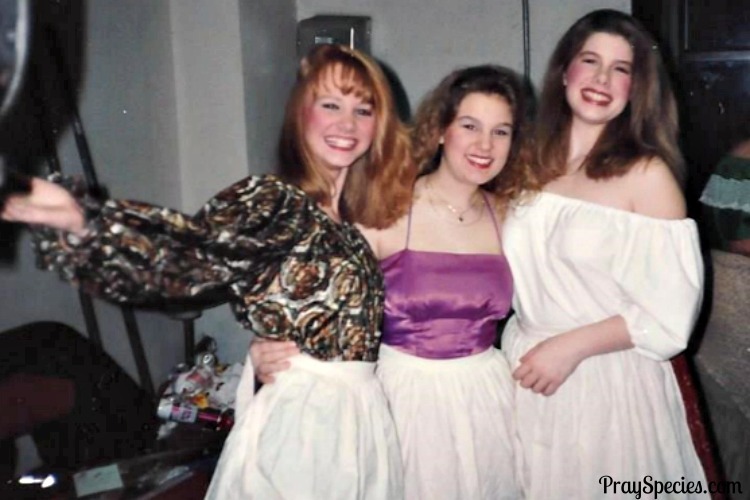 Until that moment, I had no idea that a girl without a size two body or an ability to make fun of her size 16 one could actually perform in a show outside of her local high school. Granted, I didn’t land Alice, nor ever would. That role did go to a beautiful, size two girl. A very nice one who later went on to major in theater in college. For me the theater was fun and a great way to meet friends. It was also wonderfully addictive. Alice in Wonderland would be just the beginning. I then went onto perform in Cinderella, Oliver, Some Enchanted Evening, West Side Story, In Our Own Words, Cats, The Greatest Christmas Pageant Ever and some others whose names have faded from my immediate memory. As I entered college, I struggled with illness, boys, and lost my sense of adventure as I got consumed by grades and picking a lifetime career. This was no time for fun or extracurriculuars. I was told by a counselor that unlike applying to college, job interviewers were not interested in my extracurricular activities and just wanted to see that I could get the job done. As it turned out this wasn’t entirely true, because when I did finally land my first “real” job in a Fortune 500 consulting company it was because of my time spent as a lifeguard…….and a little bit of a “performance” in my job interview. After college, I started working at that Fortune 500 company and didn’t have time for theatre or a need for it, or so I thought. I did finally have some money and I used a bunch of it to head to Broadway. I scored front row seats for a performance of the original cast of Rent. I wasn’t in the show, but I was close enough and knew all the words. It was almost as good. I also saw an amazing performance of Annie Get Your Gun starring Bernadette Peters. I can never remember the names of actors and actresses, but I remember hers. I have never laughed so hard at a performance in my life. Years, have passed. My career has changed thrice. I’ve married and had children. Now, I happily sing show tunes to my kids. Some families sing “Rock a Bye Baby” for lullabies, my babies get “In My Own Little Corner” from “Cinderella,” “Goodnight My Someone” from “The Music Man,” and “I Know a Castle on a Cloud” from “Les Miserables.” They are my favorite audience. And I like to think I’m their favorite performer. My biggest kids have grown to be four and three and know all the words to these songs and often sing with me. I don’t know if I’ll ever do community theater again. Lots of people out there can fill those roles, and only I can be Mom to my kids. But, I do know that I’m excited about sharing my love for all things Broadway and beyond with my kids. 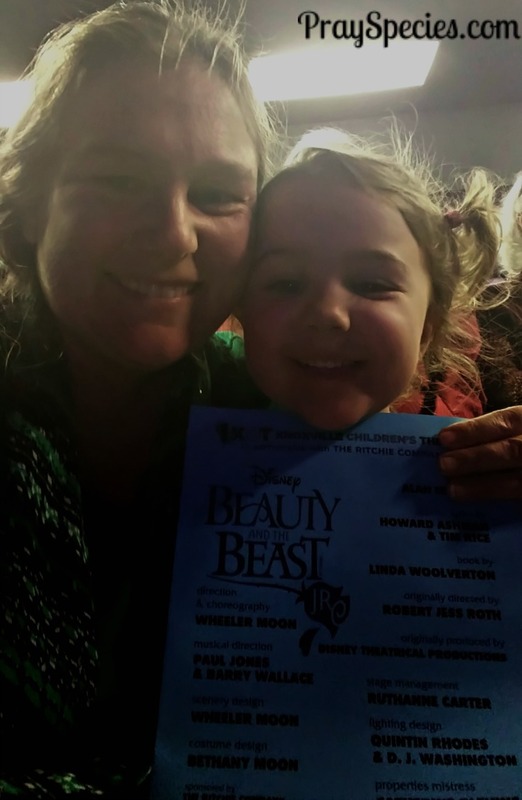 My daughter and I recently attended her very first show; a production of “Beauty and the Beast” at the Knoxville Children’s Theatre. She watched the show. I watched her. She lit up at the costumes, swayed to the music, gasped at the scary parts, and gripped my hand so tightly when the beast fell. Occasionally, she would forget herself, she is only four after all. She had some great one liners. “I don’t like that bully,” she announced pointing at Gaston. (The teenager playing that part was amazing by the way). “Why are those girls acting like that?”, she asked about the females flirting with Gaston. A grandfather in the row behind us, laughingly declared that he had been wondering that for years. “Oooooh he just burned him in the booty,” she giggled as the candlestick helped ward off attackers that stormed the beast’s castle. “Mama, Mama I think they are falling in love!,” as the beast and Belle danced. Fortunately, we had some how found ourselves seated in between rows of the parents and relatives of the cast members. I’m not sure that’s exactly how the plot goes, but if that’s what she got out of the story, so be it. She clearly enjoyed it. Turns out that lady was also The Beasts’ Mother. I couldn’t have planned it, but it made the entire experience that much better. I asked Ladybug if she would like to try to get a picture with any of the cast members. Along with everyone else, we waited in line for a picture with Belle. But when it was our turn, my daughter insisted that she wanted her picture with Belle AND the Beast. Belle actually had to track him down, I don’t think it’s a request that’s made very often. But, she got her wish. She has requested a Belle costume. Truly, I was just glad she didn’t want a beast costume, I suspect that might be kind of expensive. She has also had me read the original French version of Beauty and the Beast from The Blue Fairy Book numerous times. And apparently, there’s a new one starting “Hermione Grainger” due out soon. Being Mom is hands down my favorite role. I am loving this chance to watch my daughter fall in love with stories and with the theatre. Here’s to you my sweet daughter; may there be many more future performances for us to enjoy together! 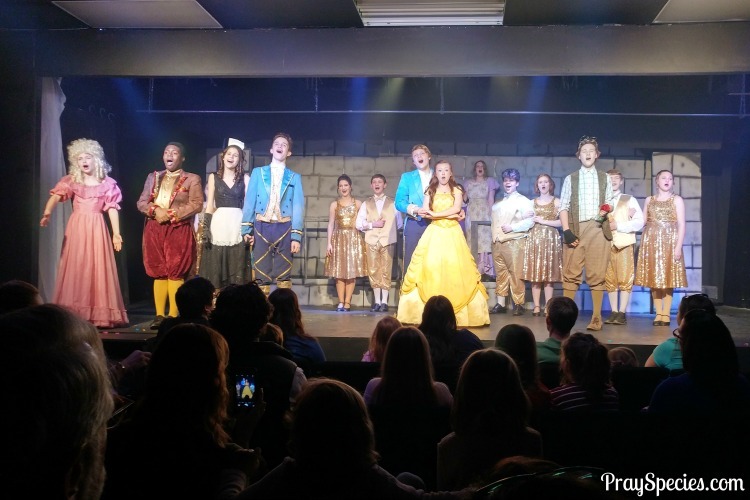 Tickets can be reserved for Children’s Theater of Knoxville, but must be paid for at the door. Performances do sell out, so a reservation is a must! Snacks are permitted in the theater and reasonably priced items are available during intermission. Booster “cushions” are available for younger audience members; a huge benefit for my daughter who was then able to see much more of the performance. Learn more about upcoming performances and reserve tickets at Knoxville Children’s Theater.